Oh, the charms of France. 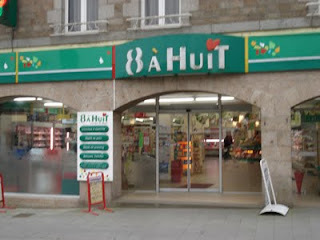 You wont find a 7-11 here, but you will find the '8 a 8'. Cutting edge in convenience, French style. It's got almost everything one needs to survive - wine, baguettes, chocolate. Even the hours of operation have their own French flair. Don't let the name fool you, this store closes at 7:00pm!